SiteGround's specially built jHackGuard Plugin will protect your Joomla install from hacks and vulnerabilities. Published: Nov 8, 2014. 11:44 +0100. Despite being big fans of SiteGround, this post proves that there are still some hidden gems in SiteGround’s offerings that were yet to discover. jHackGuard is one such example and is a Joomla Plugin that SiteGround created back in 2010 to provide added security to their Joomla customers. Also, SiteGround has just announced a major update that enables it to be more easily configured with an entirely fresh user interface. As of today, jHackGuard has been downloaded more than 86,000 times directly from SiteGround, which is not only a testament to the popularity of this plugin but also a testament to the popularity of SiteGround for Joomla Hosting. jHackguard is a combination of two components. Primarily, it provides security for your Joomla Installation, but the second component handles all the configuration of the plugin as well as providing detailed logs. Essentially, your website is protected as the plugin filters data from User input and implements various PHP security settings to restrict any nefarious activity. While the jHackGuard plugin comes pre-configured with some standard rules suitable for most websites, the settings can be finely tuned with the logs enabling the debugging of any unexpected behavior. Most other security extensions are bloated with ‘features’, which might or might not be really needed. Our plugin is nothing like this. It has been designed to be extremely fast and use minimum resources. In most cases you will never notice it, while it will continue to scan the input data and prevent hackers from compromising your website. Of course, the new changes to the plugin which you can read about below, only make this plugin excel to new heights. Firstly, the administrative interface has received a major upgrade. One great addition is the addition of the logged activity from within the component, rather than having to browse the log files themselves. Support for BoyScout has also been added. This is a free database of spam bot’s that is regularly updated, that is used to prevent spam bots submitting data (such as comments, or contact forms) on your website. New firewall functionality has been added allowing you to whitelist or blacklist IP addresses and networks, allowing you to protect from DDoS and Brute Force attacks by specified IP addresses while ensuring your access is not restricted. Before this update, the patterns and rules used to protect the website from being hacked used to be contained within the plugin itself, so the plugin had to be updated to add new rules. The new Plugin version now contains these rules on a separate server, allowing the rules to be tweaked and updated immediately when new threats emerge. 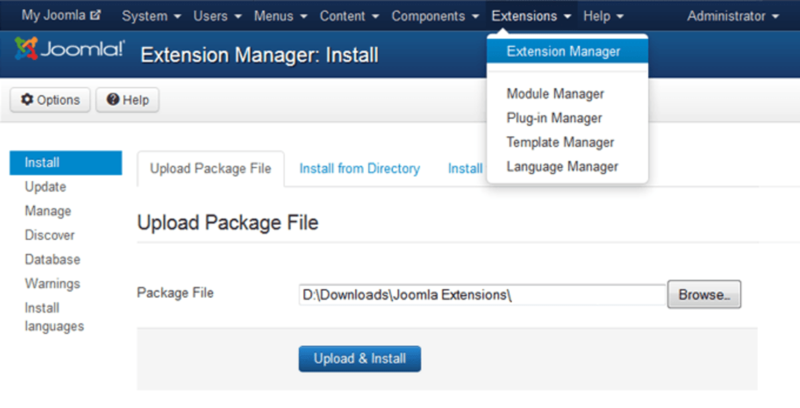 There are currently three versions of the plugin, one for version Joomla version 1.5, one for Joomla Version 2.5 and, of course, the latest version for Joomla 3. The jHackGuard plugin is very easy to install, and a matter of just uploading a copy of the plugin zip file that you can download from SiteGround here, or directly from the Joomla Extension Directory here. How to Install jHackGuard. © SiteGround. You can find a full tutorial for installing and configuring jHackGuard here. If you are serious about Joomla Security, then you need a host that has the necessary expertise and willingness to be a leader in innovation to create plugins like this. That being said, SiteGround doesn’t just rely on this plugin to keep their servers secure. At the server level, they also make many optimizations to ensure that your installation is the most secure possible. If you are interested in trying our SiteGround, we are currently offering up to 60 percent off SiteGround Hosting for our readers, which you will find full details of on our SiteGround Coupons page.